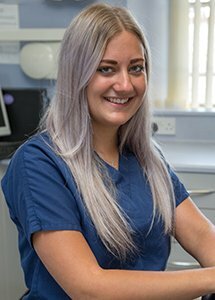 Sammi joined the Torrington Dental Practice team in 2014 as a trainee dental nurse and has since gained her NEBDN Dental Nursing qualification. Since then Sammi has been very busy and she is currently studying towards her NEBDN Certificate in Conscious Sedation and undertaking in-house training to develop her skills as a Dental Implant nurse. In her spare time, Sammi likes to travel, keep fit and spend time with her family and friends.